Mouth-Blown, Hand-Painted Glass Christmas ornament created by the fine artisans of Inge-Glas of Germany in 2009. 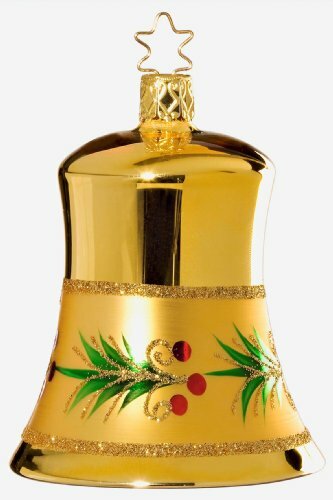 ***Golden Melody Bell*** features the TradeMarked Star Crown, your assurance of high quality and integrity in fine Christmas ornaments. Your ornament will come in an Exclusive Inge-Glas gift box with the Inge-Glas hang-tag, carefully wrapped in acid-free tissue. Packaged in an Inge-Glas gift box carefully wrapped in Acid-Free tissue to preserve your precious ornament for many Christmases to come! If you have any questions about this product by Inge-Glas of Germany, contact us by completing and submitting the form below. If you are looking for a specif part number, please include it with your message.